This cake is decorated with pink Wild Roses, white Blossoms & pink & green ribbon picks & features dropped lace work & applied piped lace. The cake is doweled & supported by white pillars. 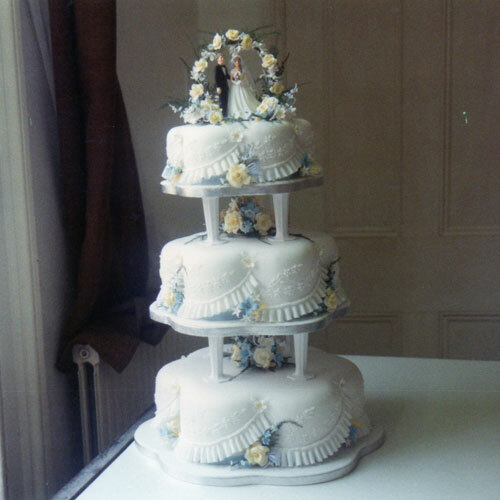 This cake was inspired by a design by Elaine MacGregor. 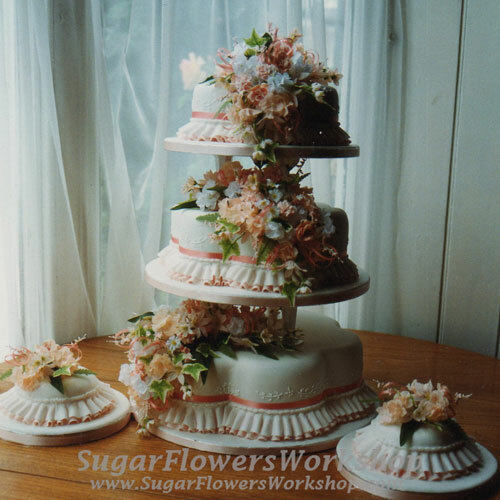 This cake is decorated with orange Carnations, orange & white Blossoms & Fern Leaves. The top tier also has 2 pastillage Bells filled with Blossoms & ribbon picks. 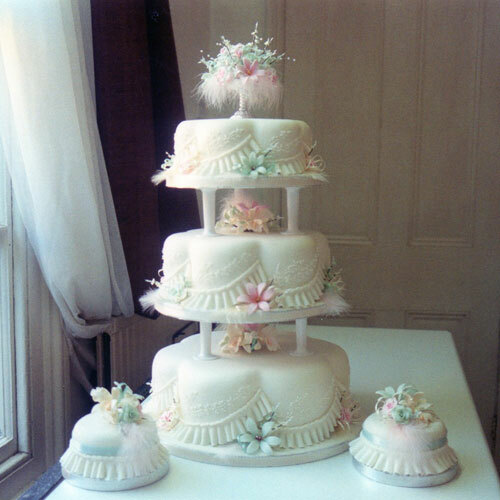 It is finished with cut-out fondant Bells on each tier & a triple layer Garrett Frill. 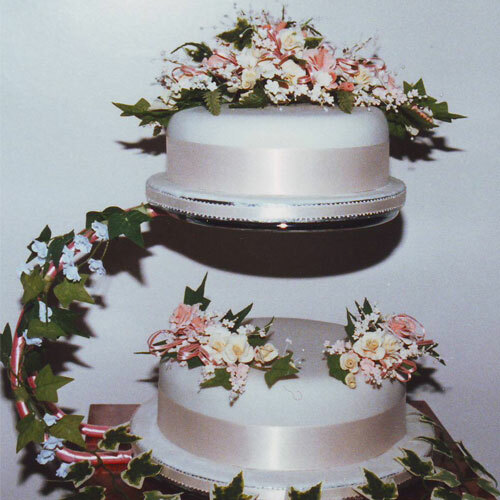 This 3 tier cake is on a stand & is decorated with pink & cream Roses, pink & cream Carnations, cream Cattleya Orchids, pink & white Blossoms, Ivy & shaded pink ribbon picks. 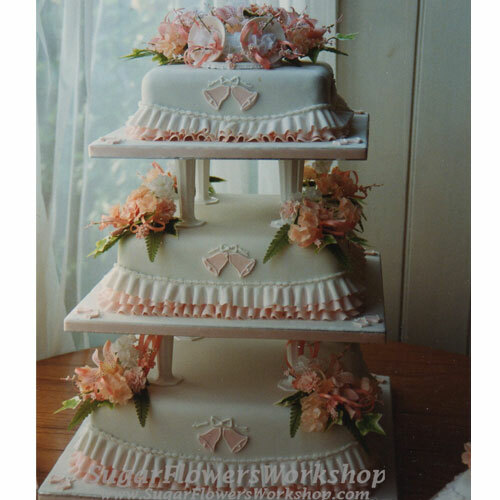 The sides of the cake are piped with Royal icing & have Garrett Frills. This is a 3 tier cake that is decorated with yellow Roses, blue & white Blossoms & Leaves. On top of the cake is a bride & groom under a Rose ring. The sides of the cake are piped in Royal Icing & blue satin ribbon under Garrett Frills. This 3 tier, stacked, fondant covered, Wedding Cake, is decorated with various shades of pink Roses & Rose Buds, shaded orange Carnations, white, pink & cream Blossoms, variegated pink Hydrangeas & Rose Leaves. 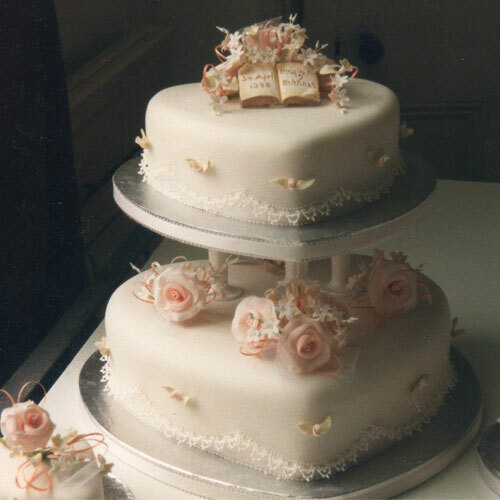 The cakes are finished with white satin ribbon. This 3 tier cake is decorated with red Carnations, yellow Blossoms, red ribbon picks & real Corn. 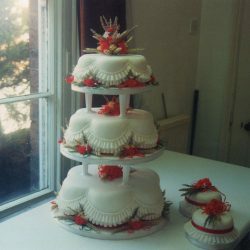 Around the base of the cakes are red ribbons under double scalloped Garrett Frills. There are sprays of Carnations & Corn on the boards. 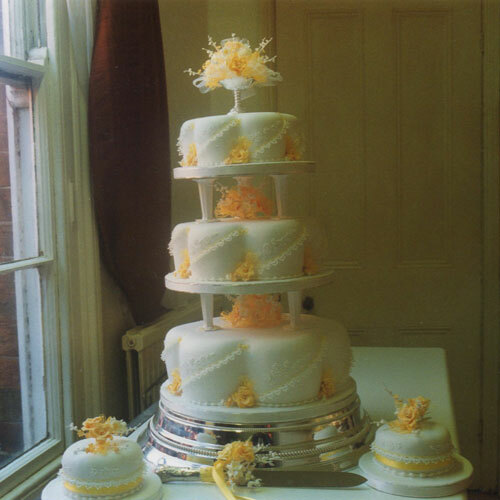 This 3 tier, pillared, cake is decorated with orange & white Carnations & Blossoms, Ivy Leaves & orange ribbon picks. 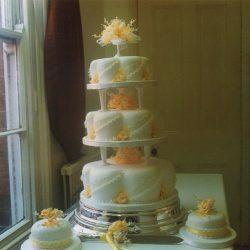 The sides of the cakes are piped with Royal Icing & finished with an orange & white Garrett Frill. The boards are finished with pale orange ribbon. This cake is decorated with orange Roses & Carnations, white Blossoms, & net picks. There is a silver bowl on top of the cake filled with flowers & ribbon picks. The sides of the cakes are piped with Royal Icing & there is applied Royal Icing lace. 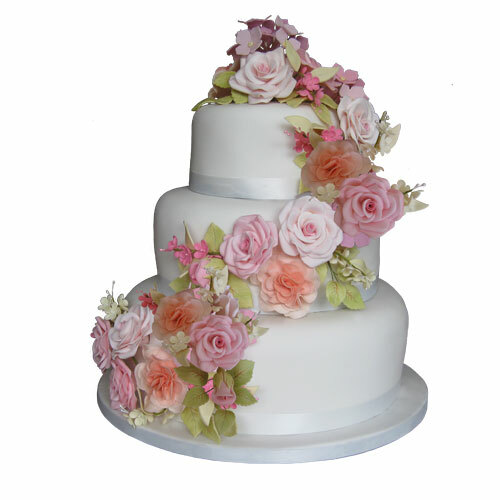 This 3 tier cake is decorated with pink Roses, yellow Carnations, blue & white Blossoms, Fern & Ivy Leaves. On top are pastillage Bells & the sides are piped with Royal Icing. The cakes are finished with pink satin ribbon under scalloped Garrett Frills. 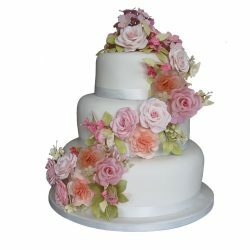 This 2 tier Wedding Cake is decorated with white & pink Roses, cream Carnations & white & pink Blossoms, pink ribbon picks, Fern & Ivy Leaves. The cakes were finished with wide white ribbons & the boards finished with ribbons to match. 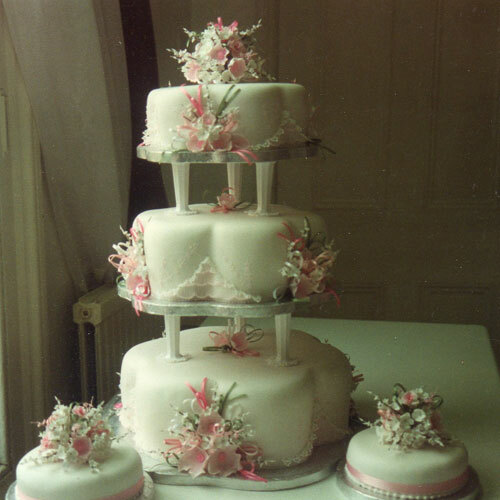 This 2 tier, heart shaped cake is decorated with pink Roses, white Blossoms & pink ribbon picks. On top is a pastillage open book with the names of the Bride & Groom. 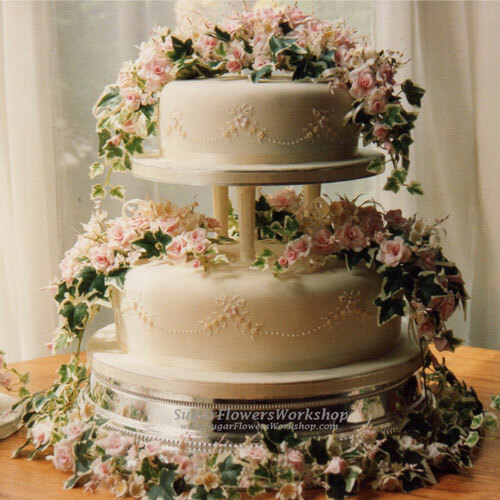 The sides of the cake have applied Royal Icing Lace & tiny Rosebuds & Leaves. 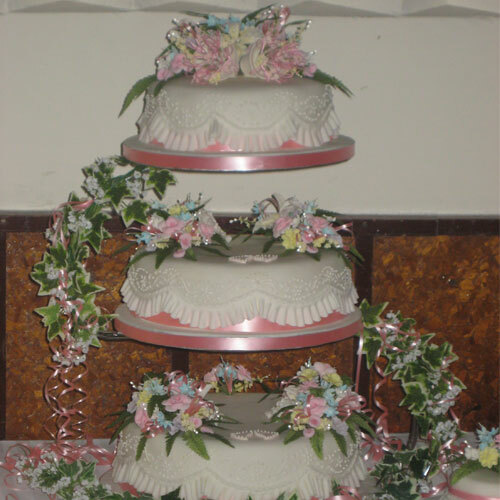 This 3 tier cake is decorated with pink & blue Lilies, Roses & Cattleya Orchids, white Blossoms & pale pink feathers. On the top of the cake is a silver bowl filled with flowers & feathers. The sides of the cake are piped in Royal Icing & have scalloped Garrett frills. 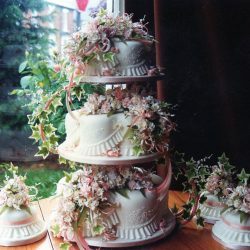 This 2 tier cake is decorated with pink Roses & Rose Buds, pink & white Blossoms, ivy & cream ribbon picks. The sides of the cake are piped with Royal Icing, pink Blossoms have been applied & the cakes finished with cream ribbon.